Kings of Ulster until the end of the 12th Century, the chiefs of this great sept were held in high esteem, and their territory lay in the ancient district of Oriel, (Counties Armagh and Monaghan), and in the Donegal-Fermanagh area. The city of Armagh over which the Haugheys once held sway is the ancient seat of the High Kings of Ulster and the ecclesiastical capital of Ireland for some 1500 years. The name, with variants Haffey, (Armagh); Hoy, (Antrim), and the rarer (O) Hoey, is an Anglicized form of the old Gaelic O' Eachaidh. The Gaelic prefix "O" indicates "male descendant of", plus the personal byname Eachaidh, "Horseman", a derivative of "each", horse. In the 1609 "Church Lands Inquisition of Armagh", Haughey (written as O' Eachadha) is noted as a principal sept located in the Glenard area. 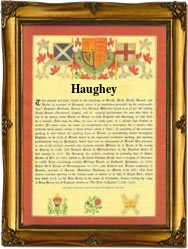 Charles J. Haughey, Taoiseach of Ireland, (1979 - ), and President of the European Community, 1990, is the most distinguished bearer of the name, upholding the proud traditions of his noble ancestors.